Stock photo of the Door of San Cristobal at the Seville Cathedral, a UNESCO World Heritage Site, in the Santa Cruz District, City of Sevilla (Seville), Province of Sevilla, Andalusia (Andalucia), Spain, Europe. Door of San Cristobal at the Seville Cathedral in the Santa Cruz District in the city of Sevilla. This stock photo shows the ornamental detailing of the Door of San Cristobal at the Seville Cathedral, a UNESCO World Heritage Site, in the Santa Cruz District, City of Sevilla, Province of Sevilla, Andalusia, Spain, Europe. 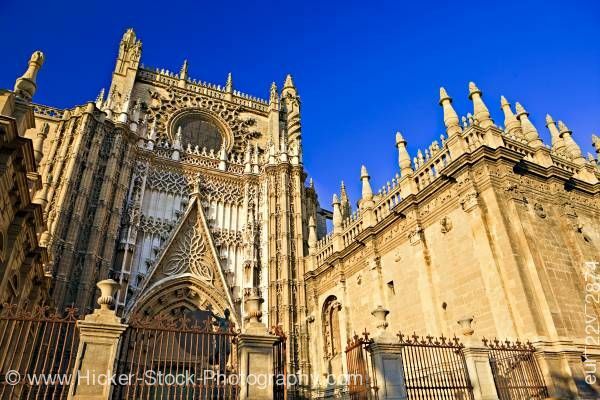 Through the striking columns and wrought iron gate is the front (façade) of the Seville Cathedral. The ornately designed cathedral shows its beautiful details in its intensity. The ornamental details of the structure display such as the urns on the columns, the spires that sit atop the roof, and the details of the entrance and the window above. A clear blue sky is a wonderful contrast to the cream colored stones of the cathedral. Door of San Cristobal at the Seville Cathedral, a UNESCO World Heritage Site, in the Santa Cruz District, City of Sevilla (Seville), Province of Sevilla, Andalusia (Andalucia), Spain, Europe.